That’s not the start to the season Roberto Luongo nor the Florida Panthers were hoping for. It’s not so much that the Panthers dropped a tight 2-1 shootout decision to the Lightning in Tampa in their regular season opener Saturday night, but the Panthers lost Luongo to an apparent knee injury midway through the second period. Luongo was hurt when teammate Frank Vatrano fell on his leg after a collision near the Florida crease. The 39-year-old netminder was helped from the ice and was not available to comment after the game. Prior to the injury, Luongo stopped all 12 shots he faced and the Panthers led 1-0. James Reimer came on in relief and played well, allowing only an Anthony Cirelli goal at 10:45 of the third period before he and the Cats lost in the shootout. While Reimer is a solid No. 2 goalie, the Panthers are hoping that Luongo can remain healthy this season and handle the bulk of the work in net. Last season, Florida missed the playoffs by one point as Luongo was limited to only 35 appearances because of injury. He played exceptionally well when healthy, posting a 2.47 GAA, .929 save percentage and three shutouts. Luongo is the winningest active goaltender in the NHL with 471 victories. He also leads all current goalies with 76 career shutouts. 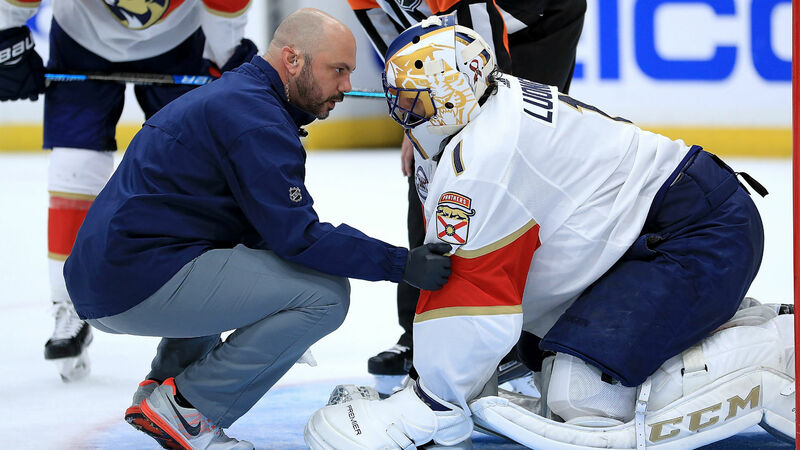 The Panthers likely will have an update on Luongo on Sunday, as well as one for veteran forward Derek MacKenzie who suffered an upper body injury in the first period. Florida does not play again until Thursday, when the Panthers host the Columbus Blue Jackets.